Thermotex Infrared Heated Large Dog Therapeutic Pet Bed w/ 1 Year Warranty! Thermotex Infrared Infrared Therapy Systems are a patented range of deep tissue infrared heat pads designed to relieve pain, promote healing and accelerate rehabilitation. Unlike conventional hot packs or heat pads that simply heat the surface of the skin by conduction, Thermotex safely delivers FAR infrared thermal energy beneath the surface of the skin. Thermotex re-invents infrared by producing 100% FAR infrared, replacing conventional infrared lamps which emit light from different parts of the electromagnetic spectrum and must therefore be used with caution. This effectively increases blood flow into the targeted area to deliver nutrients and oxygen and to keep tissues healthy while eliminating waste and easing inflammation. We back every Thermotex pad that we sell with our 100% money back guarantee. If you have any questions please call us at (701)223-9936 or Toll Free (800)355-2956. - Each pad has 11 x 13 in. or 143 square in. of infrared pad. - Muscles or joints that are causing pain. - Animals who need extra warmth. 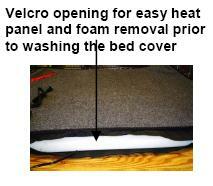 - Inexpensive to operate: Thermotex Therapy Pet beds cost around 7 cents a day to operate for 24 hours. - Machine Washable Lining: Removable cloth liner is easily removed for washing. - No Burning:Thermotex Therapy Systems are thermostatically controlled and will never overheat. - Safety and simplicity of operation: Just plug the unit into any 110 volt outlet, set on low and leave it. - Uses 110 volt power; 35 watts. - Thermotex Therapy Systems deliver pain relief by increasing the blood flow. - Increased blood flow is accomplished by using infrared energy absorption. - Infrared energy is absorbed by the body to a depth of 6 cm or 2.36 inches. - Infrared is a radiant energy source similar to the warmth felt by sunshine with no harmful rays. - As the infrared energy is absorbed, the blood flow and oxygen levels increase in the treated area. - This results in deep penetrating warmth. - This deep penetrating warmth delivers pain relief and assists with elimination of toxins. - Infrared is so safe, it is used to warm newborn babies in hospital.